Bird-Dogging Bernie Bros Blast Chelsea Clinton For ... The New Zealand Massacre? 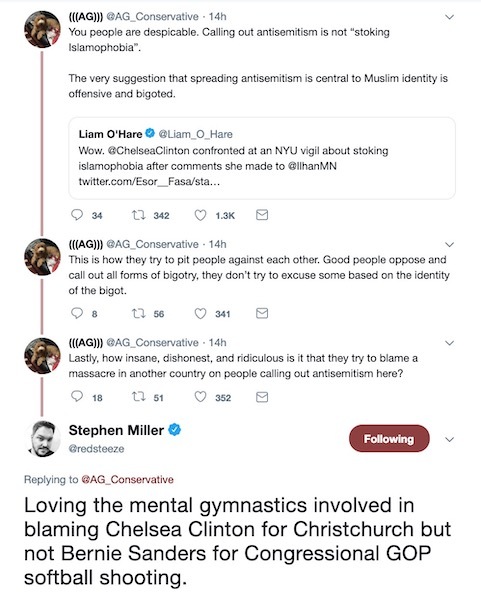 Bird-Dogging Bernie Bros Blast Chelsea Clinton For … The New Zealand Massacre? By their own twisted logic, we ought to rethink giving Bernie a pass for the attempted assassination of Scalise and other Republicans. How weird have the politics in 2019 become? So weird that the political Right is coming to the defense of Chelsea Clinton. You may have to read that last sentence again slowly because it is admittedly surreal. Long before all the victims in New Zealand could be properly identified, let alone having their next of kin notified, activists halfway around the world were already finding convenient scapegoats. You might think it would be the same tired targets on the political Right — and there was a lot of that — but they found new targets, too. Those targets, as it turns out, are people on the Left who aren’t sufficiently radicalized to the New Left’s way of thinking. This is something Chelsea Clinton learned the hard way when she was trying to show support and solidarity by visiting a vigil gathered to grieve the bloodshed in New Zealand. Activists wearing Bernie campaign shirts saw Chelsea Clinton at the event and filmed themselves slamming her for being ‘complicit’ in Islamophobia, and for being in some sense responsible for the violence in New Zealand. What did Chelsea do to provoke the ire of these people? To her credit, she kept her cool in an unpleasant situation. What should we really expect from open Marxists — a fair fight? They show up at a scene of MOURNING wearing Bernie Campaign t-shirts and pick a fight with someone famous so that their video can go viral. It’s like relative nobodies putting a trending hashtag or someone famous in their content to get attention for themselves. They’re deceitful attention whores who would be outraged over the ambushing of a pregnant woman if they thought of her as ‘on their side’. Like Robespierre and Trotsky, Chelsea is learning the lesson about Revolutions devouring its own. The first two were killed. Chelsea is just being made out to be a villain. Don’t get us wrong. We’re no FANS of Clinton, obviously. But when she gets it wrong, we say so (examples a, b, c, d, e…), when she’s dopey, we say so (a, b) and when she gets it right, we say so, too (a). 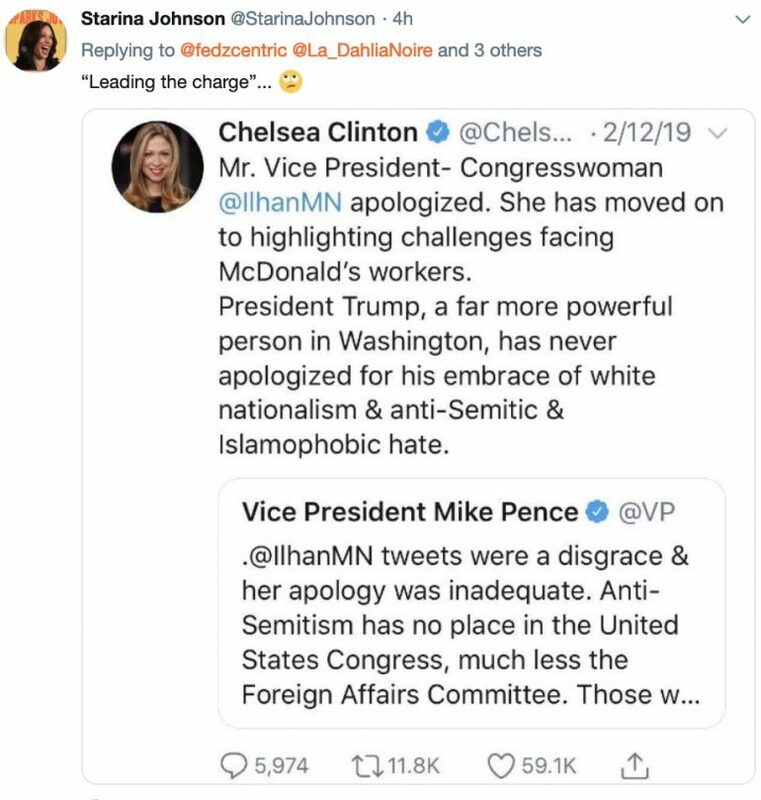 She’s being targeted explicitly because she stood up to one of the favored Freshman Class of the Democrats Ilhan Omar, and told her that racism is wrong… EVEN when it’s anti-Semitism. There was a time when that would be an uncontroversial statement. The times they are a-changing. 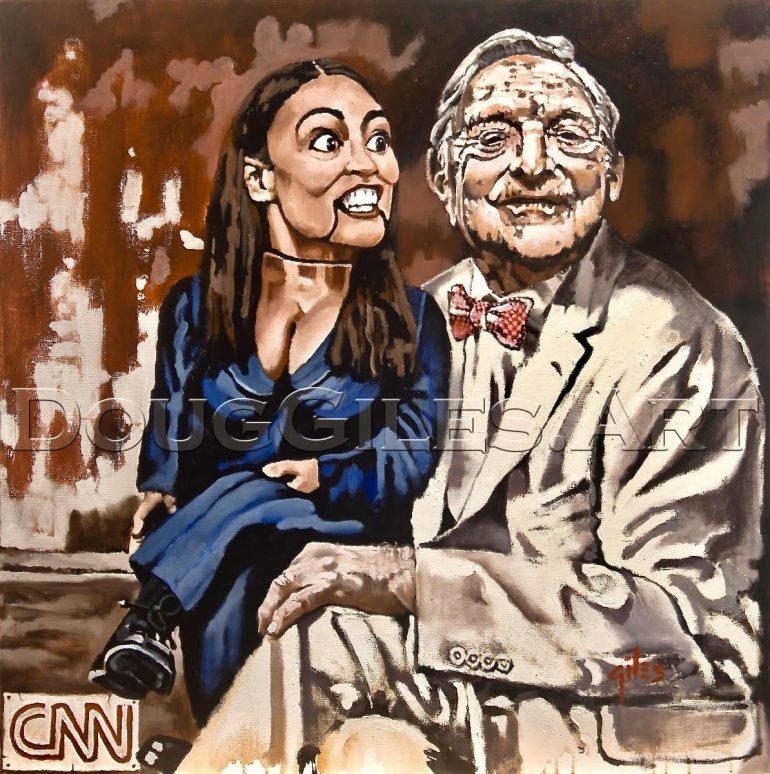 The Intersectional shift in the party has shifted politics so far as to make the daughter of 2016’s “I’m with Her” Heir Apparent into persona non grata, less than four years later. What about the chick pointing her finger and laying blame? She’s got some ugly tweets of her own. The entire movement is tainted. Sanders directly violated the Constitution when he tried to institute a religious test on a Presidental nominee. He pretends to be ‘woke’, but has had ‘MeToo’ issues in his own campaign. Now his campaigners are exploiting the deaths of 49 NewZealanders in prayer for baseless attacks pitting anti-semitism against Islamophobia. If you can’t say ALL bigotry is wrong, sit down and shut up, you’ve got nothing constructive to add to the conversation. As for ‘blame’ with the New Zealand case? This kind of divisive partisan behavior is exactly the reaction he was pushing for. You are giving him what he wants. He WANTS hyper-partisanship, gun confiscation, conflict over constitutional rights, and ultimately a race war. And supporters of the New Green Deal should be doubly careful about pointing fingers. The killer identified his chief ideology not as ‘conservative’ which he dismissed as empty corporatism, but as ‘Eco-Fascist’. What overpopulation by high-birthrate cultures would do to the Earth was supposedly a big concern to him. His only explicitly acknowledged ideological influence was the racist in Norway who went on history’s largest killing spree. Who should we REALLY blame for all this? The guy who pulled the trigger. Should we blame anyone else? Yes — if the two others in custody — or anyone else are convicted as accomplices, we should blame them as well. This shouldn’t be hard to figure out, people. These people are just another couple of sock-puppets for the ideological Left.